If you are a human being, then by nature, you are certain to have made a mistake at least one in your life. It’s something that happens to all of us. Nobody is perfect. Yet, what separates people, is the ability to gather up the guts and go apologize. But for you to be willing to write a formal letter of apology, it is safe to assume that you screwed up, hard. So, let us get straight to the important parts. 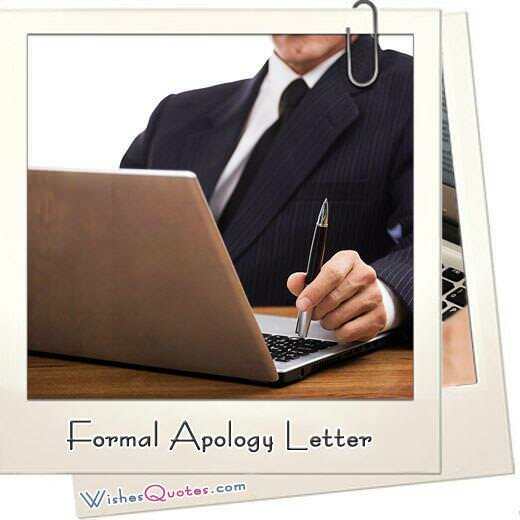 There are some basic things a formal letter of apology is required to have. First of all, you have to be sincere; you have to speak everything that is inside your mind and heart if you want to be forgiven. Another extremely important thing is the use of your language, you have to make your point, and your feelings, exactly clear, so the other person actually understands that you are feeling sorry, otherwise, it is all for nothing. Last, but not least, you have to keep it positive, but not anything flashy or overeager. But since you are most likely looking for some inspiration, we have also provided you with some templates, so you can write the best formal letters of apology! Dear Customer, We are very saddened to hear that the product you purchased from us a few days ago, seems to not be working as intended. We would kindly ask you to accept our most sincere of apologies since even though we strive for the maximum quality possible, it is only human nature to make mistakes. If you have made sure that you have done everything correctly on your end, and the product still does not work correctly, then we will be more than pleased to offer you either a refund or to give you a-hopefully- working version of the product in question. Just drop by one of our retailers at any working time, with a copy of this letter and the dysfunctional product. We value every single one of our customers, especially ones as loyal as you. Thus, as a token of our gratitude for your continued support, and a means to apologize for the inconvenience, we are also offering you a 25% discount on your next purchase from our store. We sincerely hope that such an unfortunate event can be eventually forgotten and that you continue preferring us for all of your shopping needs! Dear Sir, I would like to sincerely apologize for missing the deadline appointed for the completion of the project you had entrusted me to do. The only feelings I can express right now are shame and guilt. You had given me your absolute trust, and I have failed to deliver. The truth is, personal reasons had distracted me from my work and made me lose focus. I know that this is not a valid reason, and should not by any means be accepted, but at least I wanted you to know. It is fair to note that these reasons are no longer troubling me, so if you are willing to give me another chance to earn back your trust, I would be more than willing to accept it, free of charge of course. I value our partnership enough to not let it end like this. To ensure that I will never miss another deadline, I am prepared to work both day and night shift if needed, just to get more work out of the way. Hopefully, this incident can be forgotten in the future, and we can continue this fruitful partnership. Dear Sir, I am painfully aware of the importance of this meeting. I have absolutely no excuses for my absence, only the need to say that they are personal, and serious enough for me to be forced to miss out on that important meeting. I know the damage my absence caused to both the profits and credibility of our company, so I would not find it weird if you chose to fire me here and now. But knowing what a caring and forgiving boss you are, I sincerely hope that you can give me a fragment of understanding here. In order to make up for my mistake, I am willing to give a portion of my salary each month, as a means to repay the damage I’ve caused to the company or at least a part of it. By giving me another chance, not only do you get to give me the opportunity to strive to make this company a better version of itself but also help me combat the feelings of shame I am currently experiencing. I sincerely hope that we can put this unfortunate event behind us, and continue working side by side, as this unstoppable force our company has been throughout the years. Dear Sir, I would like to sincerely apologize for the unfortunate event that took place in one of our retailers a few days ago. It came to my understanding that you received poor customer service, and had multiple inconveniences caused by that event. Even though having the best staff we can provide, is one of our top priorities, you can never be too perfect. As chief of staff, I have to claim full responsibility for the matter, since I was in charge of the personnel responsible. The only feelings I can express right now are shame and guilt. I have to let you know that disciplinary measures for the personnel responsible for this have been put in place, to prevent any more similar phenomena that could possibly happen in the future. We know that you have been a loyal customer over the years, so as a token of our appreciation, and a way to apologize, we are offering you a 25% discount code for your next purchase at one of our stores. We hope this incident can one day be forgotten, and that you continue preferring us for all of your shopping needs. Dear Sir, I would like to express my deepest regret in regards to the events of the past few days. I take full responsibility for everything that occurred, I am painfully aware that my actions were not fitting to company standards, and that by all means I should have been fired by now, But knowing what a kind and understanding boss you are, I would like to thank you for giving me an opportunity to prove to you why choosing to let me keep my position in this company is a good idea. I am willing to work all the extra hours necessary to counteract the damage my actions have caused to this company, and do absolutely everything in my power to gain back your trust. You cannot fathom how much I value my position in this amazing workplace, and it would be extremely sad to lose it over some minute mishap like this one. Thus, I sincerely hope we can put this incident aside, and work towards a better future. I am looking forward to continue working with you, and thank you again for giving me another opportunity.